The death of an unarmed father, who was gunned down by a rookie police officer in a darkened stairwell as his girlfriend watched in horror, has been ruled a homicide, officials said. 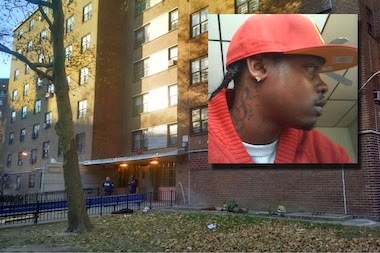 Akai Gurley, 28, and his girlfriend walked into a stairwell on the seventh floor of the Pink Houses, 2724 Linden Blvd., near Eldert Lane, about 11:15 p.m. Friday night, startling officer Peter Liang, who was conducting a vertical patrol fired a single shot from the landing above them, officials said. The bullet pierced Gurley's chest and he was pronounced dead at Brookdale hospital, officials said. The city's Office of the Chief Medical Examiner deemed Gurley's death a homicide, a spokeswoman said. The spokeswoman explained that "homicide" means that Gurley's death was caused by another person and was not a result from natural causes. It does not imply that Liang intended to shoot Gurley, she noted. The fatal shot was "an accidental discharge," according to police officials. Liang had radioed superiors afterwards to say that there had been an accidental shooting, sources said. Gurley's girlfriend, Melissa Butler, 27, was next to him when he was shot. "As soon as he came in, the police opened the [door to the] eighth-floor staircase," Butler told DNAinfo New York. "They didn't present themselves or nothing and shot him. They didn't identify themselves at all. They just shot," she added. Gurley, who lived elsewhere, had come to Butler's apartment about 9:30 after a visit to the gym and spent two hours with her, she said. After the shooting, the officers retreated back from where they came and the couple made their way downstairs, officials said. Gurley stopped on the fifth floor while Butler continued down to the fourth floor, where she asked neighbors to call 911, she said. Liang's badge and gun were taken away as he was put on modified duty after the shooting, officials said.